Traders' Insight is a key resource for market participants seeking timely commentary directly from industry professionals on the front lines of today's fast moving markets. BMO Global Asset Management - Vietnam: The Emerging China? It’s very hard to visit Vietnam and not get excited about the opportunity. Looking at the country today, there are many similarities with China 15 years ago. Indeed, the rate of development in Vietnam since it opened up to the world in 1990 is almost identical to the first 18 years of China’s growth post 1977. But the similarities go well beyond the growth rates. Like China, Vietnam remains a fiercely state-led place. The Communist party’s compromise with capitalism should be seen in the light of self-preservation, as should its recent crackdown on corruption and the strict lack of tolerance of any form of dissent. Whilst private enterprise is now encouraged, state-owned enterprises (SOE’s) still dominate the economy and the authoritarian hand of government can be seen in almost all areas of business. The model for economic development is classically Chinese: maintain a cheap currency and encourage export-led growth based on cheap land and labor. A large, young workforce provides plenty of willing hands to work the factories. And things certainly seem to be going to plan. GDP growth is roaring along at 7%, well ahead of its fiscal deficit of 3%. Of course, not all in the garden is rosy. Vietnam has a huge need for more power stations, roads, bridges, railways airports and better internet connectivity, yet infrastructure investment has been slow. Another issue is the prevalence of SOE banks, and the problems within this sector. Non-performing loans are large, probably far larger than is recognized. The role of financial institutions, so critical to an economy, is not functioning in a traditional manner. Lastly, whilst Vietnam is currently benefiting from not being China as far as the US is concerned, it does run a sizable trade surplus with America. There is some talk that when/if Trump is done with China and the EU, he will turn his gaze on Vietnam. Perhaps the most significant reform of recent years has been the drive for privatization. We have seen this ourselves as the government has sold out of Vinamilk (dairy company) and Sabeco (beer producer), but there have been many others. In 2017 and 2018, there were 20 full privatizations, 31 companies divested by the government and 45 divested by the state investment fund. Whilst these measures have fallen way behind targets, their significance should not be underestimated. The momentum should continue through 2019, with many more deals slated for the market. A large part of Vietnam’s success has been a function of its aggressive free trade attitude. On many measures, Vietnam is the most open-to-trade, large country in the world (according to the World Bank, trade equals 200% of GDP). This openness will only increase when the revived CPTPP (Comprehensive and Progressive Agreement for Trans-Pacific Partnership) comes in to force this year. Though losing the US is a blow to the project, the CPTPP still encompasses an area representing 13% of world GDP and should have a meaningful positive impact on all signatories. The US may no longer want to play, but Vietnam, Malaysia, Australia, New Zealand, Canada, Mexico, Chile, Peru, Indonesia, Singapore and Japan all do. There is even talk of a post-Brexit UK joining the deal! Beyond being cheap and young, Vietnam’s labor force is also very well educated. Public spending on education has been high for many years (6% of GDP). As a result, Vietnam’s 15-year-olds out-score their British and American counterparts in math and science in global rankings (OECD PISA 2015). One of the most remarkable things about Vietnam is the lack of any visible Chinese presence. Given their shared ideological heritage, regional proximity, and the economic similarities noted above, one might reasonably expect Chinese commerce to be all over Vietnam. But it is not. There is no Alibaba (it is there but only through the back door via Lazarda), no Tencent, no Chinese banks, no Chinese consumer brands. Indeed, in terms of investment in Vietnam, China ranks behind Korea, Japan and Singapore, and by a huge margin. China accounts for only 5% of foreign direct investment in Vietnam, equivalent to that of Australia, Thailand and France combined. This, of course, derives from the two countries’ fractious history, particularly the 1979 war. As such, the hostility to China in Vietnam has parallels with that shown in Taiwan. For companies, this is very significant; the absence of Chinese players in the market has provided the opportunity for domestic companies to grow to the extent they have. Instead, Vietnam feels like an economy that is still learning. All this potential has attracted some of the highest foreign investment (relative to GDP) across emerging markets, with many buying up whatever they can get their hands on (regardless of quality). How should we participate? History has taught us that the lion’s share of economic profit tends to accumulate to the best companies over the long-term, and we don’t see any reason to disagree when it comes to Vietnam. BMO Global Asset Management offers complete investment advisory solutions and multidisciplinary asset management strategies to institutional investors, consultants, wealth advisors and their clients. At BMO Global Asset Management, we believe better conversations lead to better outcomes. It’s why we share direct access to the insights and conversations our investment teams have to build high quality portfolios that address the investment needs and outcomes our clients seek. Visit BMO Global Asset Management’s Viewpoints for our latest insights. Subscribe to get insights from BMO Global Asset Management delivered directly to your inbox. Information posted on IBKR Traders’ Insight that is provided by third-parties and not by Interactive Brokers does NOT constitute a recommendation by Interactive Brokers that you should contract for the services of that third party. Third-party participants who contribute to IBKR Traders’ Insight are independent of Interactive Brokers and Interactive Brokers does not make any representations or warranties concerning the services offered, their past or future performance, or the accuracy of the information provided by the third party. Past performance is no guarantee of future results. This material is from BMO Global Asset Management and is being posted with BMO Global Asset Management's permission. The views expressed in this material are solely those of the author and/or BMO Global Asset Management and IBKR is not endorsing or recommending any investment or trading discussed in the material. This material is not and should not be construed as an offer to sell or the solicitation of an offer to buy any security. To the extent that this material discusses general market activity, industry or sector trends or other broad based economic or political conditions, it should not be construed as research or investment advice. To the extent that it includes references to specific securities, commodities, currencies, or other instruments, those references do not constitute a recommendation to buy, sell or hold such security. This material does not and is not intended to take into account the particular financial conditions, investment objectives or requirements of individual customers. Before acting on this material, you should consider whether it is suitable for your particular circumstances and, as necessary, seek professional advice. Interactive Brokers - Can We Please, Finally, Retire the Dow (2nd try)? Some weeks ago, when a 737 crash led to a 10% pre-market decline in Boeing (BA), I offered my opinion that it was time to remove the Dow Jones Industrial Index (INDU) from its prominence in financial journalism (www.interactivebrokers.com/en/index.php?f=5599&vid=23097). This morning we were reminded once again why that index remains an exceedingly poor market gauge. The culprit for today’s INDU underperformance is 3M Co (MMM). That stock is down about 10% on a rare earnings miss. With a price near $225, MMM had roughly twice the influence on INDU as that of $125 Microsoft (MSFT). Yet again, this exposes the deficiency of relying on price weighting in an influential index. Both companies are behemoths, to be sure, but MMM’s $113 billion market cap is dwarfed by MSFT’s flirtation with $1 trillion! Quite simply put, there is 9x more money invested in MSFT than MMM. It is silly to arbitrarily give MMM 2x the weight in INDU simply because its price is higher. Think of the silliness this way: if MMM were to split its shares 2:1, its INDU weight would be cut in half to one approximating MSFT’s. Nothing meaningful would have happened to MMM’s shareholders, yet that maneuver would have a highly meaningful effect on INDU. That’s yet another reason why so little money is indexed to INDU compared to the market capital weighted S&P 500 (SPX). That said, today’s INDU drop does indeed have some useful explanatory value. Remember the 100+ year purpose of the Dow – to measure the performance of the industrial sector of the US economy. For better or worse, the sharp decline in MMM has ramifications beyond the company. This is a company that produces a wide range of products, some that are finished goods and others that are used in intermediate stages of production. While it is imprudent to draw an economy-wide, or even sector-wide, conclusion from one company’s results and guidance, a sharp decline in a company with a broad reach throughout various industries and regions does not bode well for those who are hoping for a solid global recovery. By the way, an 8% decline in UPS also bodes poorly for global business and the supply chain. Lackluster results from Visa (V) also don’t paint a rosy economic picture. The flipside of INDU’s underperformance is the outperformance of the NASDAQ 100 index (NDX). One can complain that NDX is susceptible to the heavy market cap weightings of the leading tech behemoths. It’s not an argument that will gain much traction in a day when well-received earnings from MSFT and Facebook (FB) are leading that index ½% higher. All that leads back to today’s middling performance of SPX. By balancing the disparate moves across important sectors of the US economy, it once again provides the clearest picture of the market’s overall health. Welcome to "#SocialStocks," The Fly's weekly recap of Wall Street's reactions to social media stock news. FACEBOOK ANNOUNCES ANOTHER PASSWORD BREACH: On Thursday, April 18, Facebook (FB) announced an update to a blog post from March titled "Keeping Passwords Secure," saying that since the original post was published, it discovered additional logs of Instagram passwords being stored in a readable format. "We now estimate that this issue impacted millions of Instagram users," the company said. "We will be notifying these users as we did the others. Our investigation has determined that these stored passwords were not internally abused or improperly accessed." TWITTER, SNAP POST BETTER-THAN-EXPECTED QUARTERLY RESULTS: On April 23, Twitter (TWTR) reported Q1 EPS of 37c and Q1 revenue of $787M, against analyst expectations of 15c and $775.23M, respectively. Twitter also reported Q1 average monetizable daily active users, or mDAU, of 134M, compared to 120M in the same period of the previous year and 126M in the previous quarter. Snap Inc. (SNAP) reported Q1 EPS of (10c) and Q1 revenue of $320.43M, against analyst expectations of (12c) and $306.48M, respectively. Snap also reported Q1 DAUs of 190M in Q1, compared to 186M in Q4 of 2018 and 191M in Q1 of 2018. PINTEREST IPO: On April 17, Pinterest (PINS) priced its 75M share initial public offering at $19.00. On April 18, the IPO opened at $23.75. Barron’s writer Al Root noted in this week’s edition of Barron’s that Pinterest priced its IPO at $19 per share, above the expected range of $15-$17, and the stock opened up 25% from the offering price, and all the enthusiasm is good news for the company. The 25% surge is a strong return, but investors should beware of the headline "IPO soars in its debut" because it is actually the investors making that headline possible, he noted, adding that it "just seems prudent" to wait. The Fly is a leading digital publisher of real-time financial news. Our exclusive live streaming subscription service breaks the material information moving stocks. Our financial market experts understand that news impacting stock prices can originate from anywhere, at any time. The Fly team scours all sources of company news, from mainstream to cutting-edge, then filters out the noise to deliver short-form stories consisting of only market moving content. The Fly is your filter to the often complex world of stock news. This material is from The Fly and is being posted with The Fly’s permission. The views expressed in this material are solely those of the author and/or The Fly and IBKR is not endorsing or recommending any investment or trading discussed in the material. This material is not and should not be construed as an offer to sell or the solicitation of an offer to buy any security. To the extent that this material discusses general market activity, industry or sector trends or other broad based economic or political conditions, it should not be construed as research or investment advice. To the extent that it includes references to specific securities, commodities, currencies, or other instruments, those references do not constitute a recommendation to buy, sell or hold such security. This material does not and is not intended to take into account the particular financial conditions, investment objectives or requirements of individual customers. Before acting on this material, you should consider whether it is suitable for your particular circumstances and, as necessary, seek professional advice. Another April 15 tax date has come and gone: That’s the good news. So, how did individual filers make out for the 2019 season versus a year ago? More importantly, is that highly anticipated refund check in the mail or, better yet, already deposited in your bank account? Certainly, last year’s Tax Cuts and Jobs Act takes center stage when trying to determine the fate of the individual filer. In any given year, economists like to look at the refund tallies to find any clues of what may impact household spending as a result. In other words, was it a year of booming refunds that could be a tailwind for the consumer, or just the opposite—a disappointing year that could perhaps serve as a drag on outlays in the ensuing months? There are two sources for obtaining the data in question: The Internal Revenue Service (IRS) and the Daily Treasury Statement (DTS). For this blog post, I focused on the DTS because the data is more up-to-date than the IRS figures, which tend to operate with a bit of a lag. Thus, I was able to collect numbers through April 18 for this year and compare them to the same date for the 2018 season. Traditionally, the refund season gets underway in February and runs through the end of April. Think about it: If you think you’re getting a refund, you’d probably want to file early to receive it early, right? What did I find out? As the bar chart illustrates, this year’s overall experience has thus far come in modestly below the 2018 tally. On a year-to-date basis, individual refunds for 2019 are $232.37 billion, or 3.0% lower than last year. As you can see, the 2019 season got a bit “behind the eight ball” right from the start. Indeed, the tallies for February and March were 3.5% and 4.5% less than the 2018 figures, respectively. Some ground has been made up so far in April, but not much, with the 2019 refund number showing a +1.0% increase over 2018. So, what should we make of the 2019 refund season so far? Two things come to mind. First, the government shutdown did apparently slow things down a bit from the start. However, now that we’re in the second half of April, any shortfall from this factor probably should have been made up for by now. Second, perhaps individuals received more of any potential tax benefits in their 2018 paychecks. In that case, refund totals could be impacted accordingly. In any event, I don’t think the lower refund numbers should have a meaningful economic impact: So far, there just isn’t a large enough discrepancy. Rather, check out the lower interest rate setting. Now that could prove to be a more important factor. Have you seen 30-year mortgage rates lately? Perhaps that’s a topic for a later post! Unless otherwise stated, data source is U.S. Treasury Department, as of April 19, 2019. Interactive Advisors offers two portfolios powered by WisdomTree: the WisdomTree Aggressive and WisdomTree Moderately Aggressive with Alts portfolios. Investors should carefully consider the investment objectives, risks, charges and expenses of the Funds before investing. U.S. investors only: To obtain a prospectus containing this and other important information, please call 866.909.WISE (9473) or click here to view or download a prospectus online. Read the prospectus carefully before you invest. There are risks involved with investing, including the possible loss of principal. Past performance does not guarantee future results. This material is from WisdomTree and is being posted with WisdomTree permission. The views expressed in this material are solely those of the author and/or WisdomTree and IBKR is not endorsing or recommending any investment or trading discussed in the material. This material is for information only and is not and should not be construed as an offer to sell or the solicitation of an offer to buy any security. To the extent that this material discusses general market activity, industry or sector trends or other broad-based economic or political conditions, it should not be construed as research or investment advice. To the extent that it includes references to specific securities, commodities, currencies, or other instruments, those references do not constitute a recommendation by IBKR to buy, sell or hold such security. This material does not and is not intended to take into account the particular financial conditions, investment objectives or requirements of individual customers. Before acting on this material, you should consider whether it is suitable for your particular circumstances and, as necessary, seek professional advice. DAL: Buy stop above 59.20. Stop 57. SAIA: Buy here. Stop 67. XPO: Buy at 67. Stop 63. EXPD: Buy at 79.50. Stop 76. JBHT: Sell stop to short below 96.30. Buy stop 101.50. The IYT keeps chugging right along. It is an important space within the industrials, and the ETF is higher 13 of the last 17 weeks and is up better than 1% this week so far, too. More importantly the 13 weekly gainers ALL CLOSED in the upper half of the weekly range, a very impressive feat. The rails have been on fire with NSC up another 4% this week, although it did record a bearish shooting star candle. Look to see if there is any follow-through in the coming days. 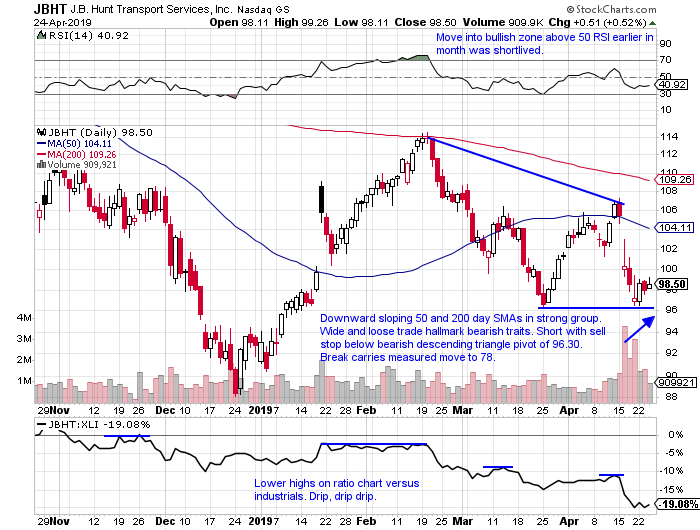 The truckers keep hitting the pavement with solid moves from ODFL and KNX Wednesday. 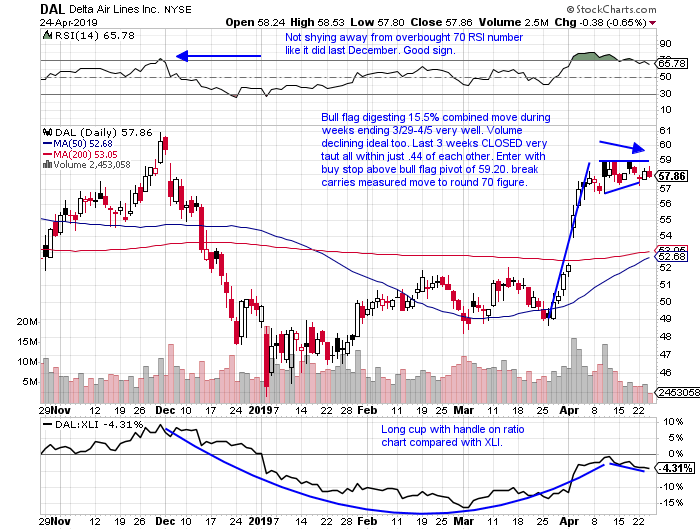 The airlines are a bit more subdued as crude continues higher, but there are some leaders setting up. We look at a few in our comprehensive report today. Ratio charts are a good way of comparing relationships between market instruments. Below I will take a look at two heavyweights and how they are behaving against one another. One, DE is breaking to the upside opposed to CAT. On an absolute basis, DE is acting much stronger just 2% off most recent 52-week highs, whereas CAT is currently 15% off its most recent peak. 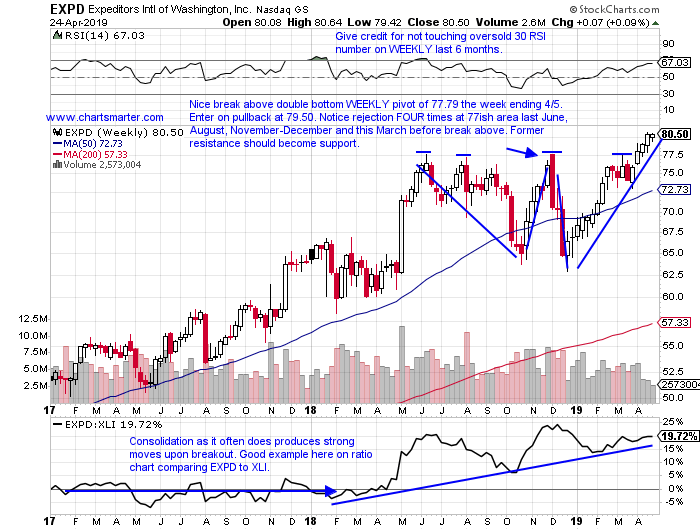 The WEEKLY chart of DE looks more visually appealing as well, with a long cup base that began last February. CAT, on the other hand, had the potential of a nice-looking double bottom base, but with the 3% plus loss so far this week, it is looking like it needs to regroup. Today registered its FIFTH consecutive negative reaction, losing 3%, followed by drops of 9.1, 7.6, 2 and 6.2% on 1/28, 10/23, 7/30 and 4/24/18. We always like to mention that leading stocks will often give investors opportunities to ADD on the way UP. I know many traditional market participants like to think the other way around, but averaging up could be lucrative. 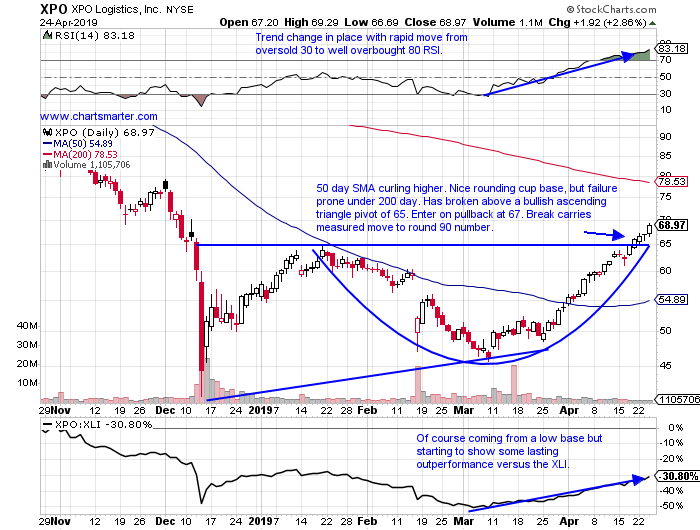 Remember the best breakout tends to work out right away, and below is an excellent example of this with the chart of UTX and how it appeared in our 4/12 Industrial Report. It took out a cup base pivot of 129.74 on 4/1, and then proceeded to take out the bull flag above 134. 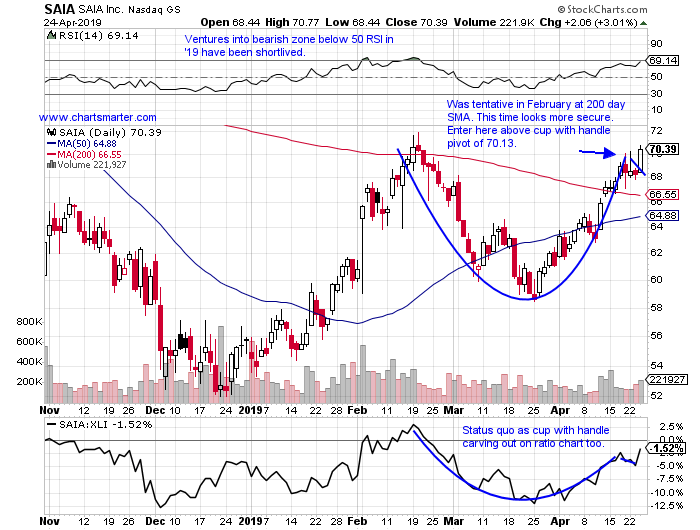 On the WEEKLY chart it could be carving out a long 7-month cup with handle pattern. Currently it is just 2 days old and must be 5 days in duration to be considered legitimate. Airline play higher by 16% YTD and 8% over last one-year period. Dividend yield of 2.4%. Holding 6% gain in double average daily volume from 4/2 after upbeat outlook very well is a solid sign. Great relative strength just 5% off most recent 52-week highs while peers UAL, AAL are 10 and 27% off most recent peaks. Enter with buy stop above bull flag pivot of 59.20. Break carries measured move to 70 number. Entry DAL 59.20. Stop 57. 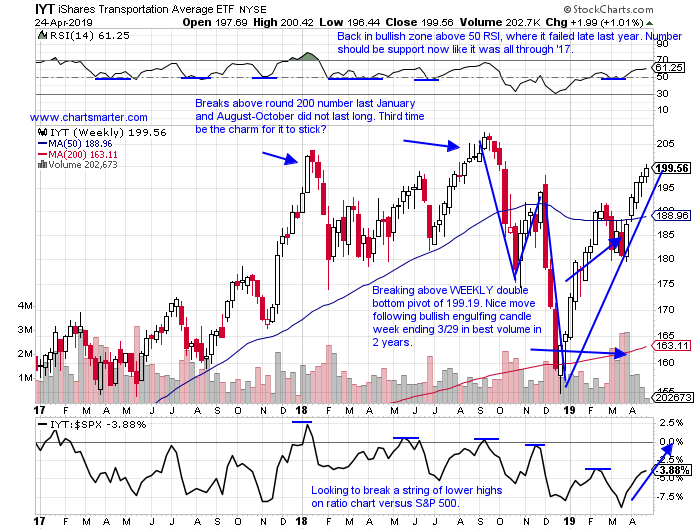 Trucking play higher by 26% YTD and lower by 2% over last one-year period. 4-week winning streak higher by 15% (rose 376.2% between weeks ending 1/22/16-6/15/18 showing stock can really accelerate). Back-to-back positive earnings reactions, rising 8% on both 2/4 and 10/31/18 (REPORTS 5/1 before open). 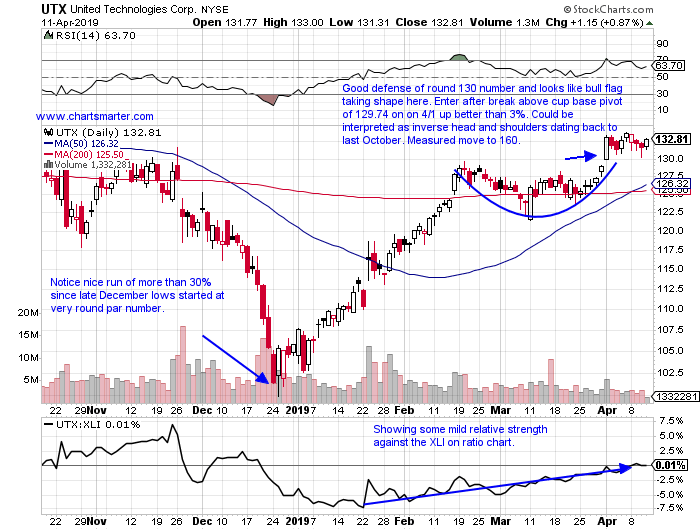 Enter here after today’s break above cup with handle pivot of 70.13. Entry SAIA here. Stop 67. Logistics play higher by 21% YTD and lower by 32% over last one-year period. Four-week winning streak higher by a combined 31%. More impressive is each week CLOSED at top of weekly range. Back-to-back earnings losses of 12.7 and 2.7% on 2/15 and 11/1/18 (REPORTS 5/1 after close). Enter on pullback of break above bullish ascending triangle at 67. Break carries measured move to 90 number. Entry XPO 67. Stop 63. Delivery services play higher by 18% YTD and 26% over last one-year period. Dividend yield of 1.1%. Advanced 14 of last 17 weeks and trading right at all-time highs. Earnings reactions higher 3 of last 4 up 1.9, 3.7 and 8.8% on 2/19, 8/7 and 5/8 (REPORTS 5/7 before open). Enter on pullback into recent WEEKLY double bottom breakout at 79.50. Entry EXPD 79.50. Stop 76. Trucking laggard higher by 6% YTD and lower by 17% over last one-year period. Dividend yield of 1.1%. Slumped 9% last week on 2nd largest weekly volume in last 5 years, and this week up 1.4%. Chart looks bad compared to peers, ODFL, CHRW and LSTR, off 25% from most recent 52-week highs. Enter to short with sell stop below bearish descending triangle pivot of 96.30. Break carries measured move to 78. Entry JBHT 96.30. Buy stop 101.50. Buy stop above bull flag DAL 59.20. Stop 57. Buy after cup with handle breakout SAIA here. Stop 67. Buy pullback into bullish ascending triangle breakout XPO 67. Stop 63. Buy pullback into recent WEEKLY double bottom breakout EXPD 79.50. Stop 76. Sell stop to short below bearish descending triangle JBHT 96.30. Buy stop 101.50. Click here to learn more about ChartSmarter research available through IBKR Account Management. The author does not hold any positions in the financial instruments referenced in the materials provided. ChartSmarter is a website dedicated to the art of technical analysis. We focus on both daily and weekly timeframes with a strong emphasis on Japanese candlesticks. Incorporated into our work is the use of traditional technical strategies such as head and shoulders, triangles, gap fills and round number theory. Inside each daily report we highlight 5 names on both the long/short side depending on the overall market conditions. The author has worked within the financial industry for more than 25 years, but for the last 8 has centered in primarily of trading capital using technical analysis. The opinions expressed by the author are his own. Trades or positions discussed by the author are neither a solicitation to buy or sell a security, nor are they investment advice. Recipients should always do their own due diligence before buying or selling a security. Every reader is responsible for his/her decision to buy or sell a security. Information posted on IBKR Traders’ Insight that is provided by third-parties and not by Interactive Brokers does NOT constitute a recommendation by Interactive Brokers that you should contract for the services of that third party. Third-party participants who contribute to IBKR Traders’ Insight are independent of Interactive Brokers and Interactive Brokers does not make any representations or warranties concerning the services offered their past or future performance, or the accuracy of the information provided by the third party. Past performance is no guarantee of future results. This material is from ChartSmarter and is being posted with ChartSmarter’s permission. The views expressed in this material are solely those of the author and/or ChartSmarter and IBKR is not endorsing or recommending any investment or trading discussed in the material. This material is for information only and is not and should not be construed as an offer to sell or the solicitation of an offer to buy any security. To the extent that this material discusses general market activity, industry or sector trends or other broad-based economic or political conditions, it should not be construed as research or investment advice. To the extent that it includes references to specific securities, commodities, currencies, or other instruments, those references do not constitute a recommendation by IBKR to buy, sell or hold such security. This material does not and is not intended to take into account the particular financial conditions, investment objectives or requirements of individual customers. Before acting on this material, you should consider whether it is suitable for your particular circumstances and, as necessary, seek professional advice. We appreciate your feedback. If you have any questions or comments about IB Traders' Insight please contact ibti@ibkr.com. The material (including articles and commentary) provided on IB Traders' Insight is offered for informational purposes only. The posted material is NOT a recommendation by Interactive Brokers (IB) that you or your clients should contract for the services of or invest with any of the independent advisors or hedge funds or others who may post on IB Traders' Insight or invest with any advisors or hedge funds. The advisors, hedge funds and other analysts who may post on IB Traders' Insight are independent of IB and IB does not make any representations or warranties concerning the past or future performance of these advisors, hedge funds and others or the accuracy of the information they provide. Interactive Brokers does not conduct a "suitability review" to make sure the trading of any advisor or hedge fund or other party is suitable for you. Any information posted by employees of IB or an affiliated company is based upon information that is believed to be reliable. However, neither IB nor its affiliates warrant its completeness, accuracy or adequacy. IB does not make any representations or warranties concerning the past or future performance of any financial instrument. By posting material on IB Traders' Insight, IB is not representing that any particular financial instrument or trading strategy is appropriate for you.